Wireless USB Made Easy | OhGizmo! 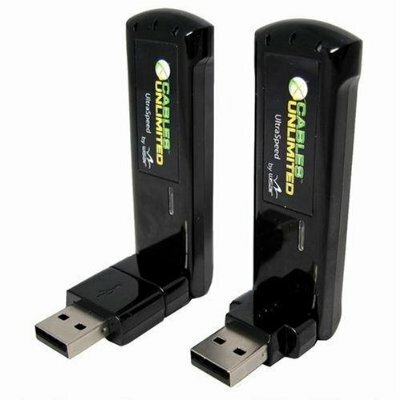 The somewhat ironically named company Cables Unlimited announced yesterday that their wireless USB adapter kit is now for sale in various places including Amazon and Fry’s Electronics for about $80. No special software is necessary, it’s as simple as plugging one adapter into your computer’s USB port and the other into the USB port on the device up to 30 feet away, and letting your computer recognize the connection just as it would if there was a USB cable there. According to the instructions, it works on USB hubs as well as individual devices, meaning just one adapter set can be used for up to 127 different USB devices. If that’s not enough flexibility for you, Cables Unlimited will at some point be selling the adapters separately, so that you can use multiple wireless USB devices with only one receiver on your computer. It would be cool if you could also use multiple receivers to share a wireless USB enabled device on multiple computers, but I’m not sure if that’s part of the deal. And needless to say, there’s no wireless power transmission, so these aren’t going to be able to directly power things like webcams (or USB volcanoes). The device side comes with a table top base and power adapter. The implication is (though I can't find them directly saying it) that it will power at least some devices. They do explicitly say on one of the spec sheets that it will not work with devices requiring isochronous support, such webcams and speakers. So if you find yourself in situations where alien identification is important to you, you need to get yourself a tribble, and now you can. This 6? furry replica prop tribble wiggles around while making sounds from the classic Star Trek episode, and you can toggle switch on the bottom to enable Klingon mode.